Students gather at Smith Point Park at sunrise (families are welcome, too!). Students train on the beach and in the water for 3-hours, followed by a hearty, barbecued breakfast. This is always our students' favorite annual event. Go Ki Dojo is honored that SUNY Stony Brook's Cherry Blossom Festival, an annual celebration of authentic Japanese culture, has invited our dojo's advanced students to present the festival's Shotokan Karate demonstrations. Lower level students are also welcome to attend and watch the demonstrations. Parents are invited to join their children's lesson on Parent Participation Day, when they can experience a typical karate lesson for themselves. Our dojo's students their families gather at Mt. 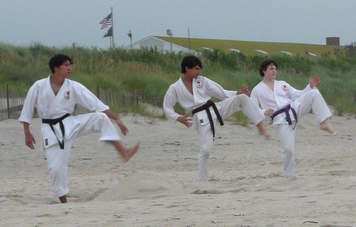 Sinai's Cedar Beach each summer for a day of fun, food, and games...and no karate. Every year Go Ki Dojo celebrates the life of Shotokan founder Gichin Fuikoshi. Families are invited to watch student demonstrations and a slide show of the past year's dojo activities (tournaments, events etc.). This is a night for the families of both child and adult karate students to learn more about the martial art their family members are studying, as well as to get to know one another. Many students invite their extended families to this popular event. This is an opportunity for the young students to take a break from training and just have fun together. Parents are welcome to attend and chat, while the kids play boardgames, Wii, or whatever strikes them. Go Ki Dojo values community, and we try to impart this to our students in easy and fun ways. 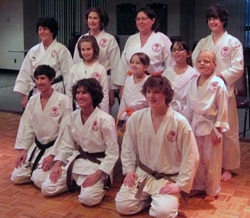 Each year we hold a "karate marathon" to benefit St. Jude's. We train for 5-hours (the littlest students just last as long as they comfortably can) and conduct a raffle and bake-sale during the marathon. It's a tradition for advanced students to tun out voluntarily on New Year's Day to begin the new year with a positive, healthy spirit, by training together for several hours.